Today’s food choices, from upper right: multivitamin x2 (I ran out of my calcium supplement! 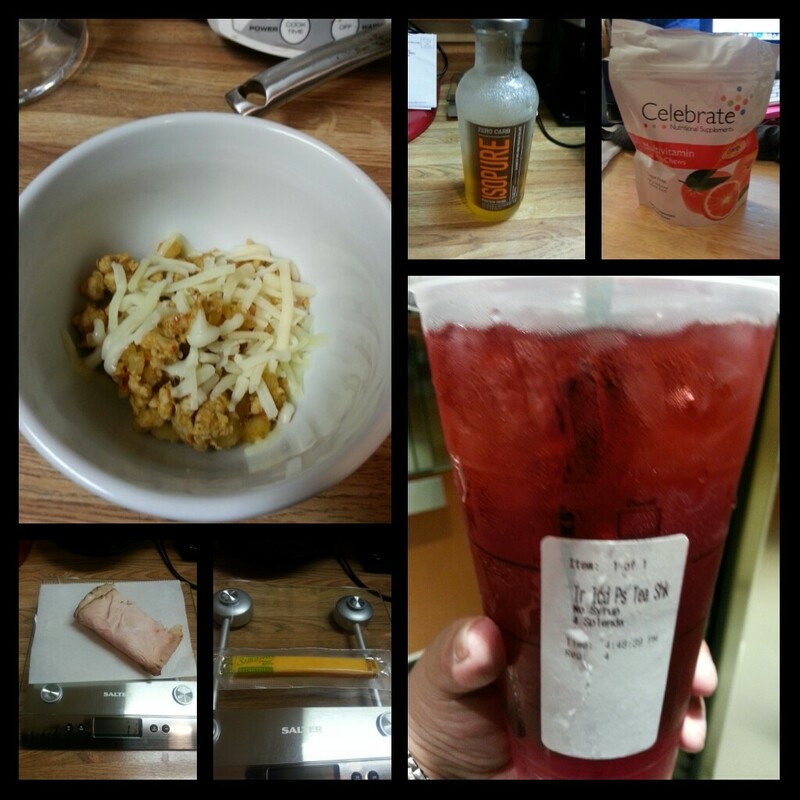 Poor planning on my part; more is on its way); Starbucks Trenta Passion Tea, no syrup, with 4 packets Splenda (so delicious); Sargento Reduced Fat Sharp Cheddar Cheese sticks x2; 2.5 ounces Boar’s Head Maple Glazed Turkey Breast; turkey picadillo taco filling with Monterey Jack cheese sprinkled on top x2. When I bought my calcium supplements, I didn’t realize that I had only bought a 15 day supply. Oops! I ordered some more last night from the manufacturer, who was giving a 25% discount plus free shipping on orders over $35. I’ll write more about them tomorrow in my Friday Five post. Stay tuned for that one! At our weekly weight loss support group meeting, Dr. A led us in a discussion about goal setting. This discussion could not have been more timely. I’d set a couple of goals for myself but hadn’t really given much thought to how I was going to accomplish them. The goals I’d set for myself were kind of vague and didn’t really have a definitive path to their accomplishment. Tonight we talked about how to set realistic, achievable goals and how we could be rewarded for accomplishing them. In order for you to have a chance of success at reaching whatever goal you set, you should be able to answer “yes” to the above 5 questions. These questions help you to determine if your goal is realistic or not. Ensuring that your goal is realistic will help you avoid setting yourself up for failure and frustration. Specific goals are much easier to flesh out and plan for than non-specific ones. For example, instead of saying “I want to get healthy,” try “I will limit my daily calorie intake to 1,500 calories a day.” The goal should be quantifiable in some way, so simply saying “I’m going to go to the gym each week” isn’t enough. Saying “I’m going to go to the gym every day after school at 5:30 pm” is–it’s something you can account for easily by logging it in a journal or using some fitness tracking app. Whether or not you will actually be able to achieve your goal is important as well. If you decide that you are going to get up every day at 5 am to work out, but you are not a morning person, it is highly likely that you won’t succeed because you’re expecting yourself to engage in a behavior that you know you won’t perform. So think about whether or not the goal you set for yourself is something you are likely to be able to do. Relevancy is also important–does your goal help you to accomplish other goals you have already set for yourself? I think that the goals you set for yourself should relate to one another in some way so that they help you accomplish a larger overall goal. For example, the fitness goals I have set for myself are going to help me accomplish my ultimate goal of getting to my goal weight, which is 180 pounds. I may adjust that as I get closer to it, but right now that weight is the target I’m aiming at. Finally, the goal should be time-bound, or as I like to think of it, time-sensitive. You should have to accomplish it by a certain time, or time interval. This is not to say that if you don’t get to that goal by the time you’ve established that you have failed–that’s not it at all. What I mean here is, do you have a reasonable time frame in which to accomplish what you’ve set out to do? All that being said, the tool Dr. A gave us is a list of six questions to ask yourself when trying to set a goal. 2. When will I reach my goal? 3. What are the steps to achieving my goal? 4. What are my short-term goals? 5. How will I monitor my progress? 6. Who can help me achieve my goal? Who will make it more difficult? 1. What is my goal? To ride the recumbent bike at the gym for at least 30 minutes 3 days a week. I am trying to accumulate mileage toward taking a trip to Chicago–so however many miles I ride on the bike get “banked” until I ride the distance to Chicago from Dallas, which is 925 miles. Once I hit that total mileage, I’ll fly myself to Chicago. 2. When will I reach my goal? I plan to start the bike rides next week and achieve the goal of riding 3 days a week by September 30. I want to build up my stamina so that I can ride for longer each time until I get to an hour-long ride each time I ride. 3. What are the steps needed to achieve my goal? I will pack my gym clothes in a bag and leave them in my front seat so that I go to the gym after school certain days of the week (Tuesday and Friday during the week, and Sundays on the weekend). If my clothes and shoes are sitting in the car, I have no excuse for not going. I plan to schedule gym dates with myself as recurring events on my Google calendar in my phone. I am more likely to attend an event if it shows up in my phone as a recurring event. The final step is to just GO. 4. What are my short term goals? I plan to start next Friday afternoon after school. I will be clear for full physical activity next Wednesday. I have chosen Fridays because Wednesdays and Thursdays, I have after school commitments that do not allow me enough time to squeeze in a trip to the gym. I plan to start by riding 15 minutes, and working my way up to 30 minutes as my stamina increases. 5. How will I monitor my progress? I plan to use my heart rate monitor, my Fitbit Flex and MyFitnessPal to log my activity. 6. Who can help me achieve my goal? My husband and my friends are a great source of encouragement and support. They have been fully supportive of my efforts to improve my health thus far and I do not anticipate this changing once I add activity to the mix. My self-care is critical if I expect this tool I have been given to work the magic it so often appears to work, and that I have seen work in others who also have it. Beyond my ultimate goal of achieving a weight I’ve never been as an adult, I have a vanity goal of wanting to be one of my surgeon’s success stories that he features on his website. I’d like to get there by Christmas next year. I think it’s totally possible, as long as I set smaller, realistic goals that I can check off as I accomplish them. I am worth the time needed to accomplish the goals I set for myself. I deserve to have good health and a long life. I deserve to have time to work toward these two things, and will fight tooth and nail to get that time. My self-preservation instinct is strong, and my fight is unstoppable. I am worth it. So are you. This entry was posted in daily bites, goals, vsg, weight loss surgery and tagged daily bites, goal setting, goals, planning for success, post-op eating, post-op life, she's got skillz, sorry for sleeve rocking, support, VSG, vsg realness, WLS, work that head game. Bookmark the permalink. What kind of multi vitamin are those? Gummy, chewable? And are they good? Im looking for a good chewable vitamin!!! They are from Celebrate Vitamins. They are a soft chewable multivitamin, so they have the texture of a Starburst, and because these are orange, they do kind of taste like that too. These don’t have iron in them–I was told I did not need iron supplementation just yet. I really like them because the hard chewables were chalky and didn’t taste good to me. They also left a lot of grit in my mouth. 😦 I highly recommend these! Im taking a chewy, starburst like Calcium supplement and I love them! I was hoping these would be the same because I also hate the chalky grittiness of chewing up a regular “chewable” vitamin. I will definitely have to go out and buy these, they are exactly what I was looking for! Good to know they dont have iron in them, I will have to ask my NUT and see if she wants me to be taking something for that. I just went ahead and bought them online. They have an autoship option that I may use with my next order so I don’t have to think about remembering to order them. 🙂 Celebrate’s customer service is also really good. Love the goal setting information. Thanks for sharing this. You’re welcome. Glad I could help educate you.